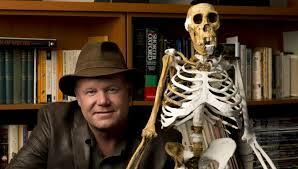 Professor Lee Berger speaks on "Exploring the Origins of Humanity"
In this engaging talk, Prof. Berger will explore some of the latest finds out of Africa that are fundamentally altering our understanding of the origins of humankind. From the breath-taking discoveries of the most complete early hominin skeletons ever discovered from the South African site of Malapa, to the recent Rising Star Expedition which resulted in the discovery of the richest early human ancestor assemblage ever discovered on the continent of Africa, Berger will both entertain and enlighten with stories of the dangerous expeditions deep underground that were required to recover these important fossils, and explain how these latest discoveries are transforming our understanding of the pathways to humanity, and of what it means to be human. Prof. Lee R. Berger Ph.D. D.Sc. FRSSAf ASSAf is an award-winning researcher, explorer, author, palaeoanthropologist and speaker. He is the recipient of the National Geographic Society’s first Prize for Research and Exploration and the Academy of Achievement’s Golden Plate Award. His work has brought him recognition as a Fellow of the Royal Society of South Africa, the Explorer’s Club and the South African Academy of Sciences. He holds and has held prominent advisory positions including the Chairmanship of the Fulbright Commission of South Africa, the Committee for nomination of the UNESCO Cradle of Humankind World Heritage Site, the Senior Advisory Board of the Global Young Academy and the Centre of Excellence in PalaeoSciences of South Africa among many others. He has been awarded several humanitarian awards including the Boy Scout Medal of Honor for saving a life and the Red Cross Certificate of Merit.